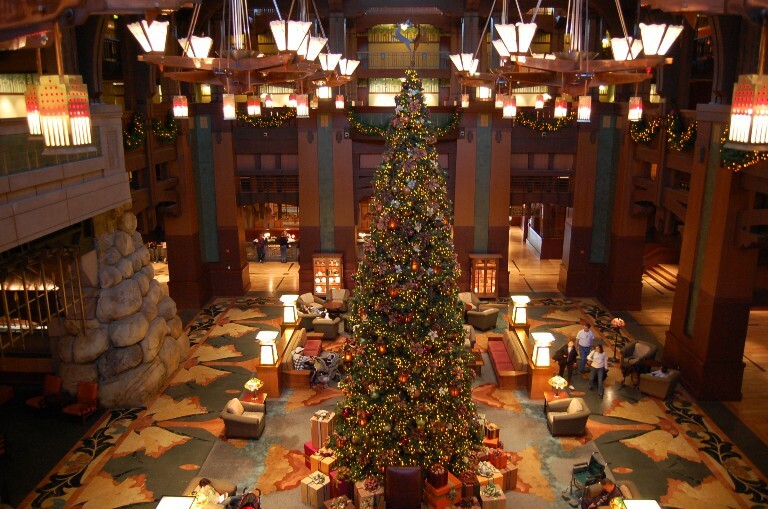 As Disneyland’s premium hotel, The Grand Californian Resort and Spa is a fantastic place to stay at Disneyland. I know opinions on this vary, and we have stayed both on and off property, but we prefer to stay on property. The hotel itself is beautiful. It’s built as a craftsman era hotel, with a great deal of detail in all the woodworking and stone that surround you in the hotel. The lobby is fantastic and is six stories high. You can look down from each floor into the massive lobby. The lobby is well-appointed with plenty of seating and a giant fireplace. There is even a TV with little chairs so the kids can have their own spot to watch Disney shows. And at Christmas time (which is when we usually go) it is even more magical, but Christmas at Disney is its own post all together! There are plenty of restaurant choices as well. 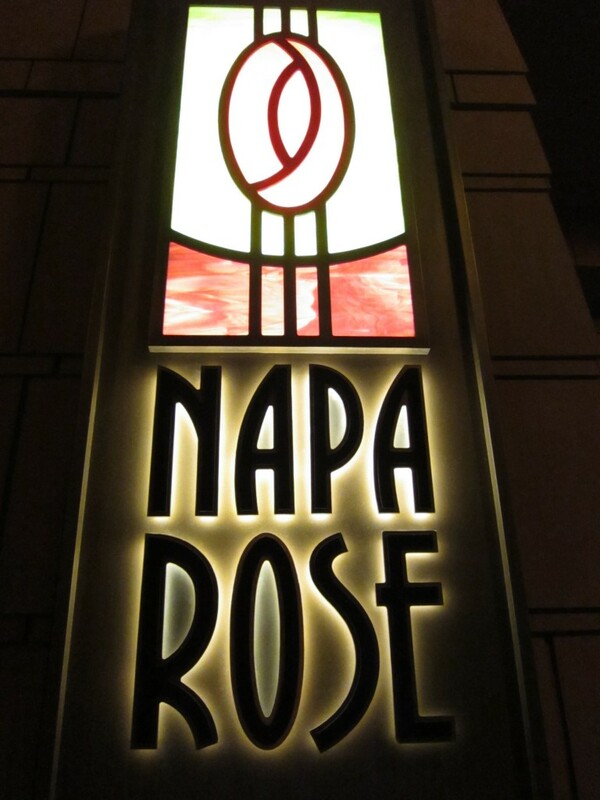 The Grand Californian houses one of Disneyland’s fine dining restaurants, Napa Rose. We got to enjoy Napa Rose on our last trip! There is also a great family restaurant, Storytellers, as well as some quick service places like White Water Snacks. 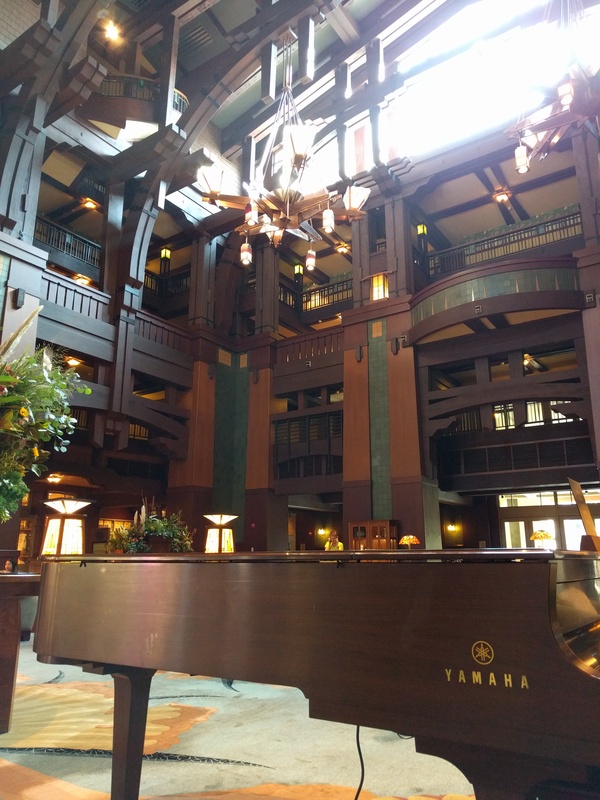 If you’ve been to Disney World the Grand Californian is similar in theme to the Wilderness Lodge. 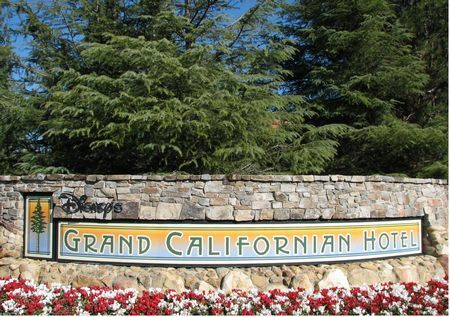 We will always choose the Grand when visiting Disneyland and we also always select Club Level. Here are few reasons why. It’s the closest to the park entrances of all the on property resorts. We debated staying at one of the others but when looking at the map we liked the proximity of the Grand to the parks. We have a younger child (2.5) so the ease of quickly being able to get back to the hotel for a nap if needed was a highlight for us. It has its own entrance to the California Adventure Park. Again the ease of getting back to the hotel was a draw for us (as was being able to get right into the park from the hotel on Magic Morning). Some rooms have bunk beds and a trundle. So for our family of five, this was great. The older kids got one of the bunks and the younger one got the trundle. So everyone had their own bed, no sharing and less fighting (well except who got to sleep on the top bunk…). 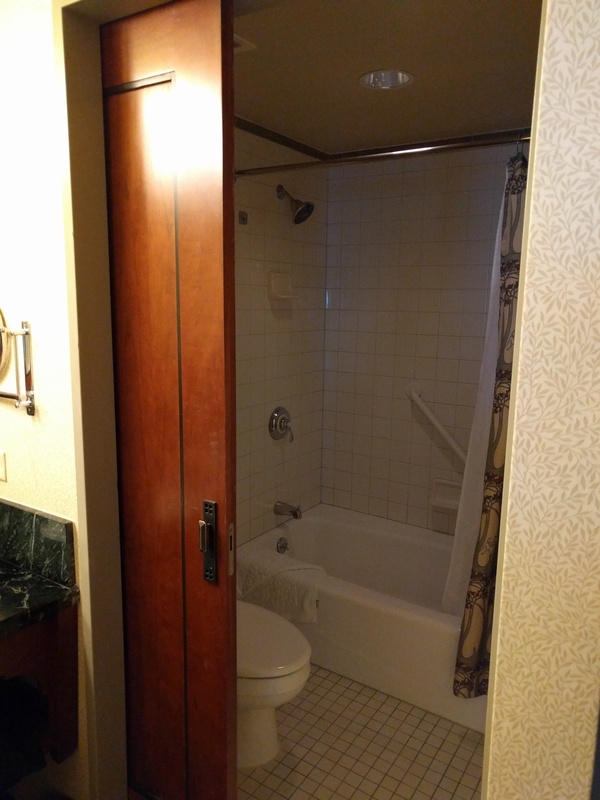 The sink is separate from the shower and toilet. I believe this is the case with most Disney hotels, and it’s a positive for sure. As someone can be showering while others are getting ready. 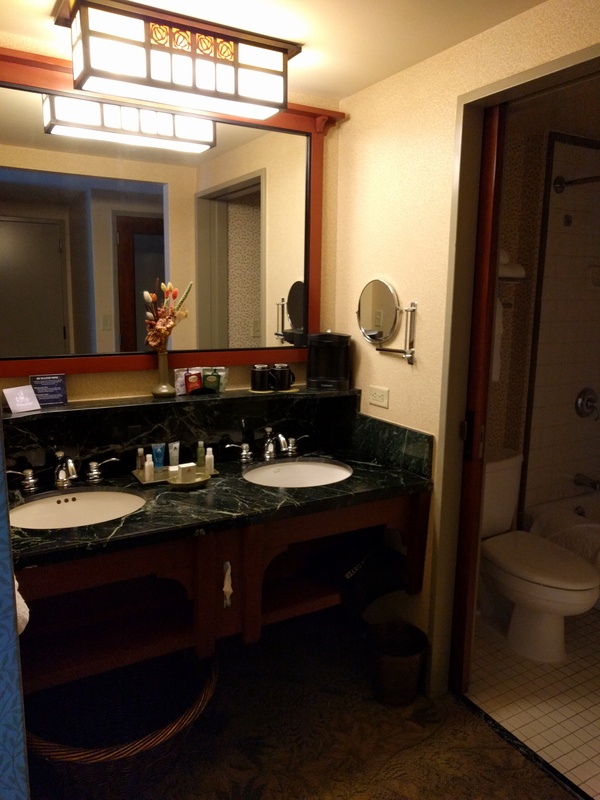 There are double sinks and plenty of room to move around. 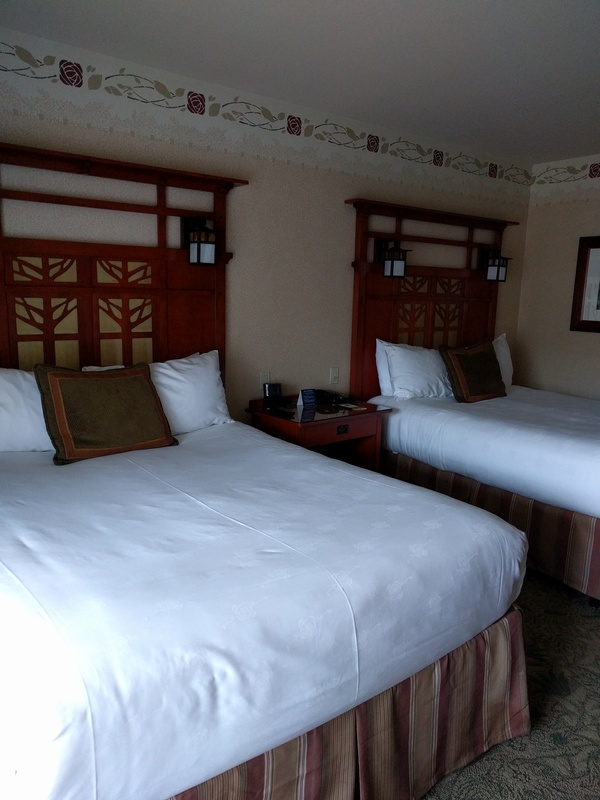 You have multiple view options, this is not a huge one for us but I know others that like to have a view to go along with the rest of the Disney magic. 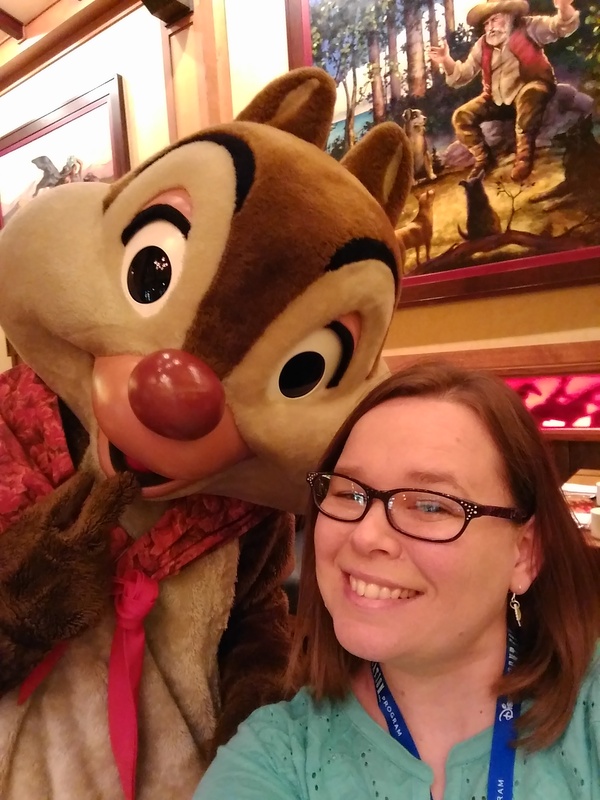 You leave the hotel and you’re right in Downtown Disney. So in the event you forget something (like tennis shoes…) or just need a break from parks and want to shop or eat you have so much to choose from without having to walk or get in the car and drive somewhere. There is a World of Disney right there as well so you can get all your Disney Souvenirs! The pools! Yes plural! There are three pools at the Grand. The children’s pool and also a pool that includes a water slide. There are even cabana’s you can rent to enjoy a rest day at the pool. 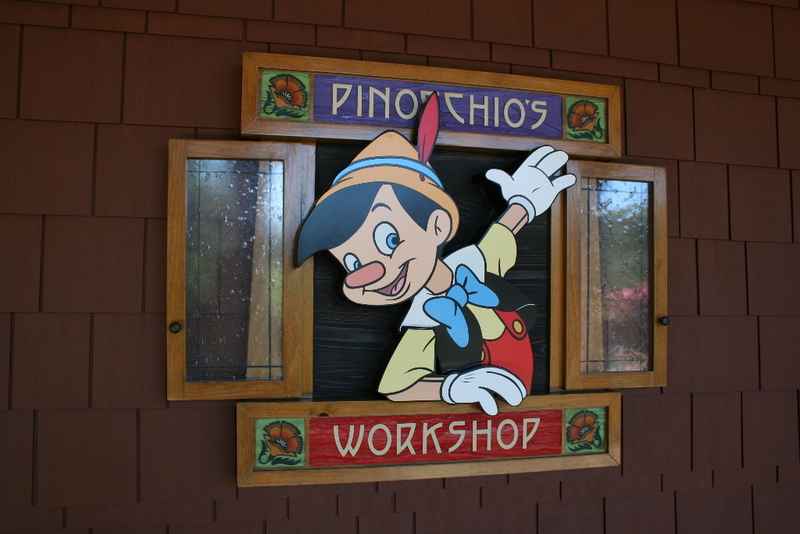 Pinocchio’s Workshop – You can leave your kids here to play and you can go enjoy time alone and maybe go to the full service Spa or Napa Rose. We utilized this on our last trip and the kids (ages 10 and 8) had a good time. They ate dinner, played games, did crafts and didn’t complain! 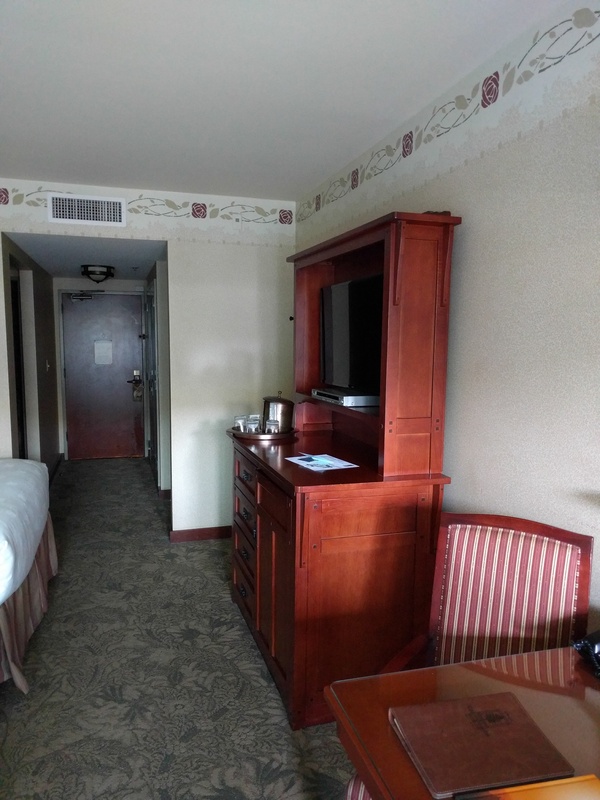 This is open to all guest staying on property but it’s located in the Grand. What about Club/Concierge Level? We really like the Club level. It offers its own check in area on the 6th floor and a lounge which has food and drinks throughout the day and evening. I’m sure there are plenty of articles out there that debate if the Club level is worth it and it’s probably not for everyone. This is my experience with it and why we like it. The lounge is only available to guests on the Club Level floor and a valid room key is required to enter the lounge. There are three “meals” throughout the day and drinks are always available. The breakfast is a nice option for us because the kids are antsy to the get the park and don’t want to sit down for a full meal and I am not the traveler who keeps milk in the fridge so the kids can have cereal in the room. The breakfast choices are usually assorted pastries and muffins, fruit, cereals and milk, bagels with cream cheese, assorted meats and cheese (we usually make a bagel sandwich). And of course juice, coffee, tea and pop. This year they added an espresso machine so you can really get moving! You can also request bottles of water which are great to take into the park with you if you’re bringing a bag since you can refill them at any restaurant for free. The afternoon tea option has assorted tea sandwiches, cookies, and fruit. There are also goldfish crackers and a party mix (think Chex mix). We usually fill a lidded to-go cup with the snacks and either bring them into the park or back to the room with us. And again all the drinks are available anytime throughout the day. The evening reception offers beer and wine, assorted cookies, scones, chocolate dipped strawberries, nuts and dried fruit. This is a nice option if you’re taking a quick break from the park and want to spend a few minutes relaxing. You can also view the fireworks from the balcony, and they broadcast the music along with it. So it’s a great option if you have smaller kids that will be going to bed earlier than others. The last thing they have is story time with cookies and milk. The kids can sit on the floor with their cookies while a cast member reads them a few stories. You can sit at a table and enjoy a glass of wine and relax right along with them! It’s a nice way to end the day. An ending note about the Club level is the personalized service you receive. They will call you to touch base before your trip to make sure of your plans and any additional needs. They will also help you make dining reservations and offer dining suggestions. We were there when it was raining and they helped us repair rips in our rain gear by sharing their duct tape! They really up the magic factor in my opinion. I had a difficult time coming up with cons, but finally had one. Sometimes the line to get into California Adventure on Magic Morning can be huge and it’s faster to go to the main entrance. However, I will note that on my last trip they seemed to improve the logistics of this so it wasn’t as bad. Like I said at the beginning this is our preferred hotel on the Disneyland Resort, so of course we would recommend it. I hope you get a chance to enjoy some time there too.